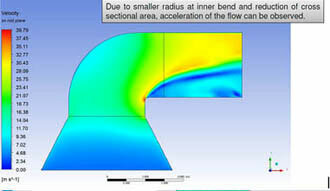 Visualization of flow pattern inside the duct bend and optimizing the design to reduce the pressure drop. The duct utilized to carry air in the cement industry was successfully analyzed for pressure drop. It was found that the bend geometry was responsible for pressure drop in the flow due to recirculation zones. Two design modifications were suggested to reduce the pressure drop significantly. Utilization of suitable duct design is one of the factors that influence the overall plant efficiency and lower the consumption of energy. Primarily, ducts carry high pressurized air to transport raw materials, needed to manufacture cement. As such, air supply through the ducts with suitable pressure is crucial, pointing to the requirement of effective duct logic. One of the leading cement manufacturers from India approached Hi-tech with a similar engineering problem associated with the duct design. Their primary concern was to devise an effective duct design that does not promote excessive pressure drop, especially across the bends. 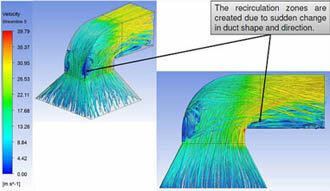 The duct design was first modeled using CAD tools, and was analyzed for pressure drop through the application of suitable boundary conditions and turbulence model. The results showed the development of recirculation zones near the bend region, promoting pressure drop significantly. Based on the results, two design alternatives were suggested, which were aimed to reduce the pressure drop considering the geometrical feasibility. The comparative results obtained were beneficial in terms of reducing the pressure drop. Both the designs showed significant reduction in pressure drop, making them a viable choice for an overall improvement in plant efficiency.